The Costa Calida is rapidly becoming the 'place to buy property in Spain'. The area of Murcia is a stark contrast to more commercialised and overdeveloped Spanish resorts, retaining its rugged coastline and cultivated landscape it encompasses many attractions. With excellent access to and within the province, the existing main motorway/fast road network is due to be linked between Cartagena and Vera in Almeria, and with a new airport due to be built in 2006 this will further increase Murcia's attraction for the UK tourist trade. Food lovers will enjoy the vast selection of tapas bars to be found in Murcia’s traditional squares together with a fantastic selection elegant restaurants serving the very best local cuisine. With fabulous landscapes and mild climate, Murcia's cultural and economic development makes it a strong investment opportunity, and a sort after retirement location. Offering a range of sporting activities, beautiful mountain scenery and endless golf, Murcia is a popular all year round tourist attraction. The stunning Mar Menor is the largest salt water lake in Europe divided from the Mediterranean by a natural breakwater known as the La Manga strip. With over 320 days of sunshine a year and calm shallow waters the Mar Menor is popular with both families and water sport enthusiasts. Mar Menor bay is also famous for it’s natural mud baths, which are said to have special healing properties for people with rheumatic or arthritic problems. With mountains, green valleys, forests, windmills, palm trees and fertile plains the Mar Menor really is one of Spain’s best kept secrets. 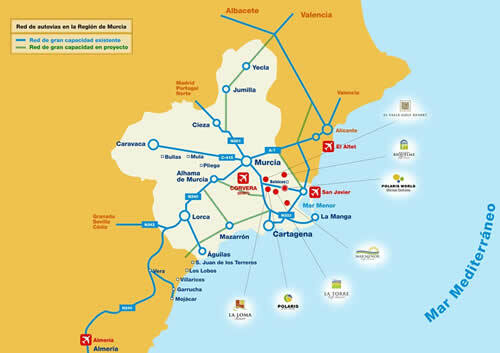 Murcia (San Javier) airport has regular flights to and from Europe’s major cities. This together with a new international airport due for completion in 2007 access could not be easier.